Red2120's Club Penguin Cheats, Secrets, And Give Aways! : 101 Buddies? Club Penguin Glitch! 101 Buddies? Club Penguin Glitch! Hey penguins! 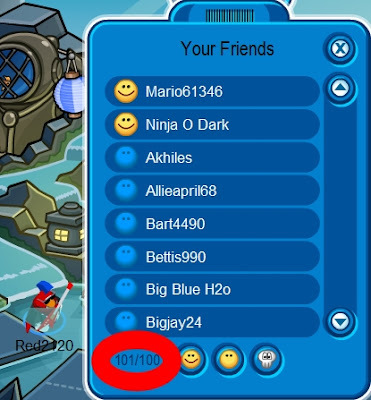 Remember my last blog post when I was mad about Club Penguin telling me my Buddie list was full when I only had 98 buddies and Club Penguin would not let me add people because they said it was full? If you don't remember click here. Well today, I looked at my Buddie list and I have 101 Buddies. But I'm not complaining! I'm glad I have 101 Buddies this is awesome! This is officially my favorite glitch! I even counted my buddies and I have 101! Check it out! I have seen that but for me it says 105 friends.